CityGrips Large Single Bar fit strollers & prams that have one single handlebar. They fit perfectly over jogger strollers, and any stroller without a center break system. CityGrips Large Single Bar measure 9 inches or 23cm long and come in a pack of 2. Keep your stroller cleaner, healthier & more beautiful for You & Your Baby. Protect grips from wear & tear. Machine was and dry dirt and germs away. 2 per pack. CityGrips not only provide a cleaner, more germ-free stroller, they’re also cushiony soft…so much more comfortable then the sweaty factory rubber or foam grips most stroller come with. CityGrips make ordinary “off-the-rack” strollers really stand out in a crowd! (ever go to the park and lose your stroller in the crowd?) CityGrips add a cheery splash of color and design…and a touch of fun that make your stroller instantly recognizable! Made of a soft Jersey and neoprene secured with velcro for easy on and off assembly. Q. Will it fit my stroller? A. CityGrips Large Single Bar fit over almost 90% of strollers. Click here to get a full list of strollers it will fit. Q. Does CityGrips double bar fit over existing grips or replace the existing foam/rubber? A. They fit over the existing foam. If you no longer have the foam/rubber you can still slip them on over the metal bar but they may not fit as well without the extra bulk. Q. How do I wash CityGrips? A. You can put them in your colored wash on any temperature and put them in the dryer. Q. How long does it take for me to receive my CityGrips? A. We ship from Los Angeles California. Orders are shipping First Class Mail with USPS.com Shipping inside the USA can take anywhere from 1 day to 5 days. International Shipping can take anywhere from 5 days to 15 days. We do not have tracking for international orders. A. If you’re not happy with anything at all you can return your product for a full refund at anytime, no questions asked! Well, we might ask what the problem was so we can improve on any issues that might exist but apart from that you are free to return any purchase for a full refund. Q. What is CityGrips made of? A. CityGrips are made of Neoprene and Printed Jersey. Q. Does CityGrips contain Latex? A. No, our CityGrips do not contain any Latex, they are latex free. Q. What materials are in CityGrips? A. 20% Styrene butadiene rubber, 5% Natural rubber, 4% Carbon nanotubes, 25% clay, 20% Calcium carbonate, 11% Softening oil. They appeared to be quite small, but once I put them on the handle they were perfect. Purchased to cover holes in the stroller grip that my moving company so delightfully caused. Snug fit and great design. Almost looked like they belonged there. 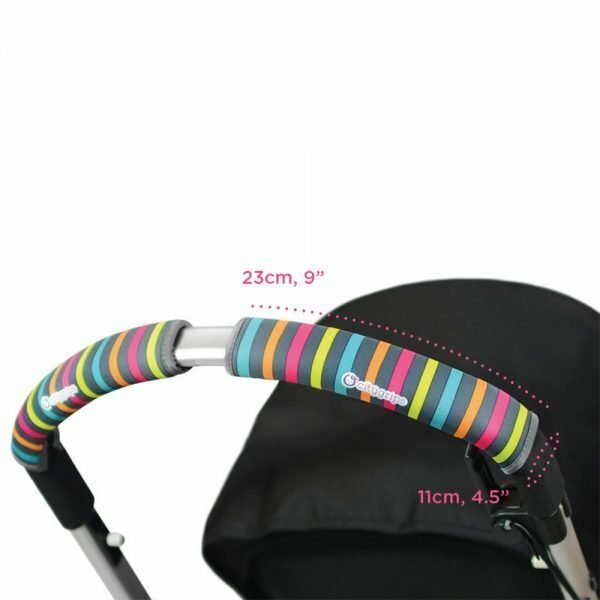 Absolutely adorable Broadway Stripes CityGrips looks on our stroller !!! We love it !!! Great way to add a pop of color and protect your stroller handle bar. I love the soft feeling and the fact that I can just throw them in the washing machine and they come out perfect! The best stroller accessory ever. I can’t stroll without it now. bought the aqua whale and baby hippo large city grips for my Combi Catalyst and i LOVE IT! The City grips covers gives you the option to wash the “ick” off of your handle bars. Love Love Love it. I bought these for my Britax b agile stroller. We checked our stroller while traveling, and the handlebar had a small tear in it when we got it back. These covered it perfectly. Should have bought these initially. I also think it is more sanitary as the handlebar is not easy to clean. The cloth and velcro is of Gd quality. feels comfortable and looks gd on my new bugaboo. Will get more in different colours. Worked on my joovy ergo stroller. There was no way to slip a grip on my stroller so these worked perfectly. I like them very much. It was what I was expecting thanks!! These fit my stroller handle bar and protects it from my hands/sweat…I love that you can easily wash them. They look nice as well. Not only are these super cute, but they prevent me from getting blisters when pushing for long periods of time. We have a city mini, and the rubber always rubbed my hands. These help, and were perfect for our Disney trip!! Love that they are machine washable (in a pillowcase) and easy to use. I was so tired of getting sweaty hands from my son’s stroller. Even when walking a short distance and in cool weather. I was about to get a steering wheel cover like the one in our car and cut it up to fit the handles. I thought surely someone makes handlebar covers. And I found City Grips! I love the variety of colors that are sure to match whatever stroller you’ve picked. And they’re easy to put on and can stretch easily. And they’re washable. I wish I had found them sooner!! I love them thank you!